Welcome to Peony's Nursery at Victorian Gardens Cattery. 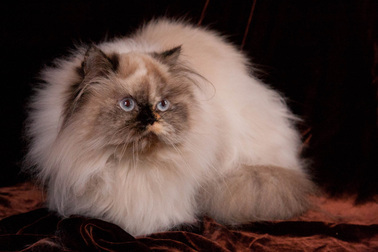 In Peony's Nursery, we feature her new Himalayan litter, including their photos, videos, parents, and pedigrees. You will find all the latest news about her babies and their growth on "Our Cattery Blog". We usually are blogging several times a week during our kitten season. 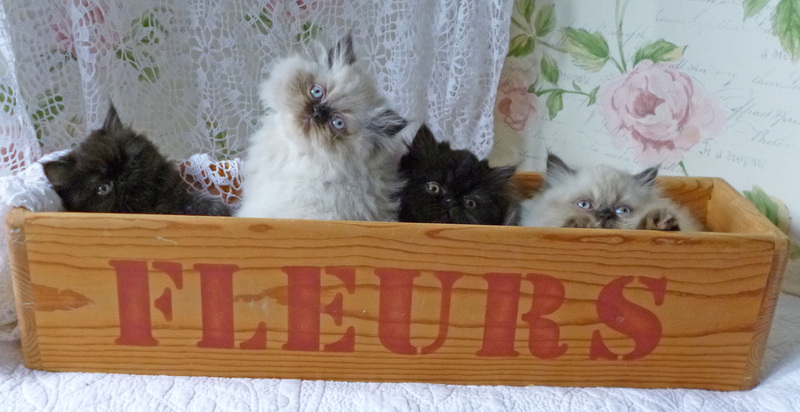 Her babies will remain on our Nursery page and then will be made available on the Available Kitten Page. Please enjoy watching the videos and looking at our newborns. Each day the babies change. It could be their color changing, or their size, or their eyes opening. It is always an exciting time at the Cattery when the babies arrive. We have ordered this page with the most recent videos and pictures at the top then going to Day 1 at the bottom. Enjoy Peony's newborns as much as we do. If you are interested in being on the wait list for one of our litters, please fill out the "Kitten Application" and return to us. More information on our policies are found on the Prices and Policies Page. Serious only inquiries please. Peony's babies are now walking very fast up to you when you come near them. They are making great progress. As of last nights weigh-in, Little Miracle has gone past his Seal sister in weight and his fur is starting to come in thicker and lengthen. He is a love bug and loves attention and petting. He is a character! Our Seal girl's fur is starting to show the regular Seal cream roots which will be her normal fur color. She is walking, almost running now. She is very cobby with nice short body and legs. We are seriously considering keeping her as a future breeder. The Seal's girls eye color is a little different than the two boys at this time. Her baby eyes are deep Royal Blue, where as the boys are a very deep blue gray. The larger Flame Point boy is so sweet and gentle. We may have a lapcat in the making. All her babies are carrying the chocolate gene and one or two should be carrying the dilute gene. Only DNA testing would decide who is carrying the dilute gene. This video features all three babies as they walk for the first time on the blanket. They are now playing and rolling around. Peony talks to her babies throughout the video. Enjoy. May 15, 2013 - Day 13 - Peony and Willie's Newborn Miracle Babies - Featuring "Little Miracle"
Babies are doing great!! Peony talks to them as she nurses them and cleans them. 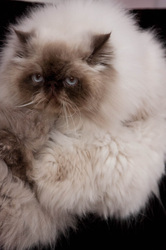 Our "Little Miracle" is our first male Chocolate Point Himalayan at our Cattery. They are all gaining from 10 to 20 grams a day. Enjoy. Enjoy watching these miracles grow right before your eyes in Peony's Nursery. Read about these precious miracles in Our Cattery Blog. Peony is an amazing mom whose babies and her went through horrors at the hands of an unscrupulous Veterinarian's Office. That this babies are alive, healthy and thriving, show God's amazing miracle of life. We are contemplating calling the littlest newborn, Miracle. We have had many people offer their recommendations on names for this litter including: Prayer, Faith, Miracle, Joy and Hope. Don't know yet if there are any girls, but we will give them another week before bothering them to check.